Is it possible to set a plastic calculation of the internal forces in RSTAB or are the internal forces exclusively calculated elastically? 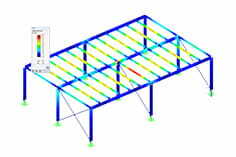 In RSTAB there is also the possibility to determine plastic internal forces. To do this, one must select a plastic joint as non-linearity via the rod properties (see Figure 1). However, this does not involve interaction of the plastic forces. Another possibility is to directly set joints with nonlinear properties. However, with this method you have to estimate in advance where these joints form. In RFEM it is possible to select a corresponding material model (see Figure 2).